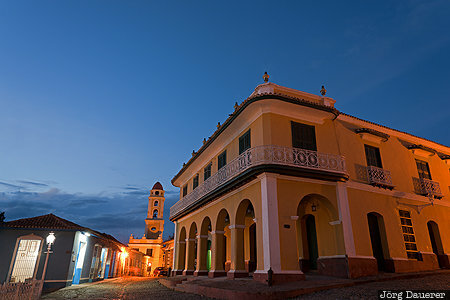 Plaza Mayor in Trinidad with the flood lit bell tower of the convento de San Francisco de Asis in the background at the blue hour after sunset. Trinidad is in the province Sancti Spíritus in the south of the Caribbean island of Cuba. This photo was taken in the evening of a sunny day in March of 2016. This photo was taken with a digital camera.